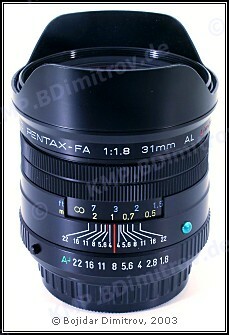 Asahi Optical Co., Ltd. is proud to announce the marketing of the SMC Pentax-FA 31mm F1.8 AL Limited as a new addition to its highly acclaimed "Limited" series of interchangeable lenses. Designed for use with the Pentax line of 35mm-format autofocus SLR cameras, this new lens offers exceptionally high image quality and a beautiful aluminum body with metallic silver finish. The SMC Pentax-FA 31mm F1.8 AL Limited now joins its two popular sister models – the SMC Pentax-FA 43mm F1.9 Limited and the SMC Pentax-FA 77mm F1.8 Limited – and becomes the first in the Limited series to offer a wide-angle perspective. 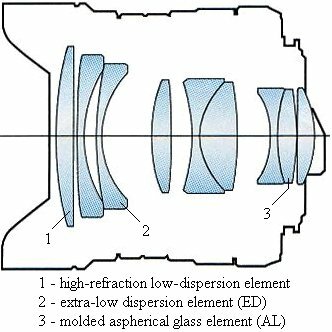 Incorporating a molded-glass aspherical lens elements into its 9-element, 7-group optics, this lens offers sharp, crisp image reproduction, even at the maximum aperture of F1.8, with a very soft rendition of out-of-focus areas. 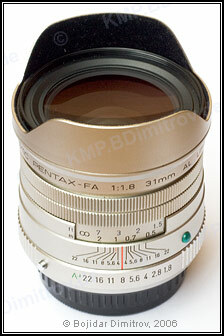 The Pentax-original floating mechanism effectively compensates for fluctuating aberrations, especially when photographing relatively close subjects. This new Limited-series lens offers a minimum focusing distance of just 0.3 meters (one foot) for the 0.16-times magnification. It even comes equipped with an exclusively designed flower-shaped lens hood, which not only cuts down excessive light but also allows for easy attachment and removal of filters.